Sometimes you'll end up needing more digital input than there are pins on your Arduino. 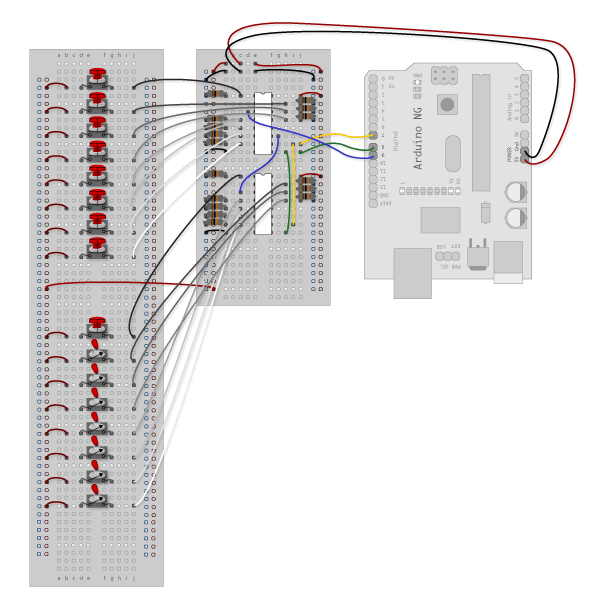 Using a parallel to serial shift register you can collect information from 8 or more switches while only using 3 of the pins on your Arduino. 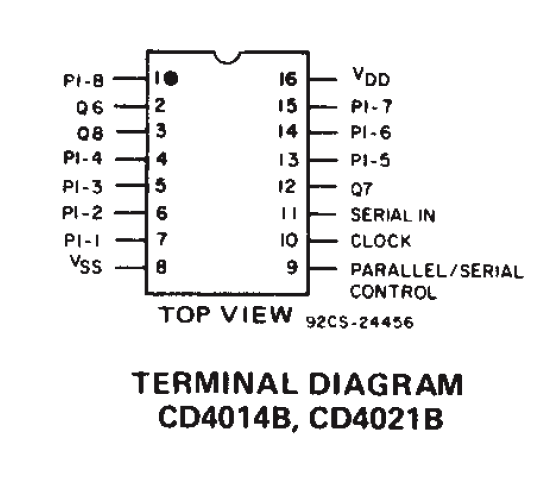 An example of a parallel to serial register is the CD4021B, sometimes referred to as an 8-Stage Static Shift Register. This means you can read the state of up to 8 digital inputs attached to the register all at once. This is called Asynchronous Parallel Input. "Input" because you are collecting information. "Parallel" because it is all at once, like hearing a musical cord. "Asynchronous" because the CD4021B is doing all this data collection at its own pace without coordinating with the Arduino. 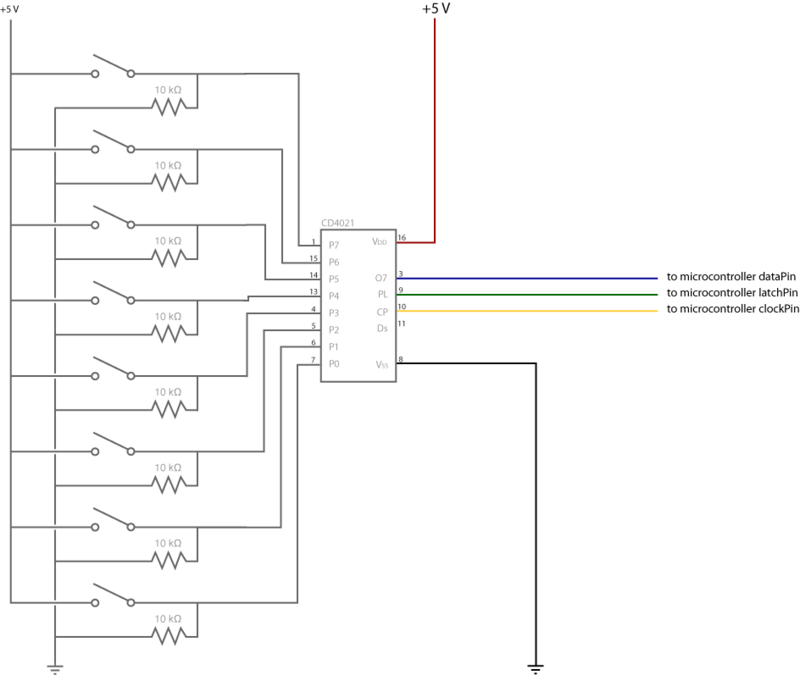 The 8 inputs are translated into a series of HIGH and LOW pulses on the serial-out pin of the shift register. 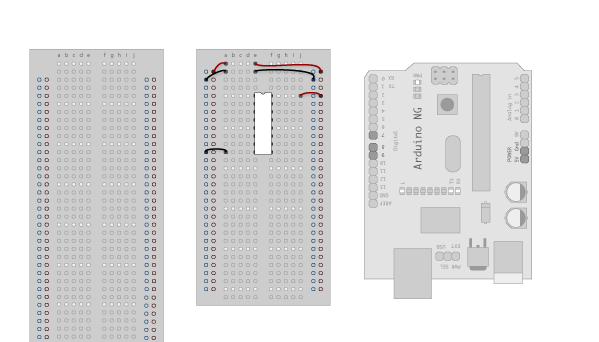 This pin should be connected to an input pin on your Arduino Board, referred to as the data pin. 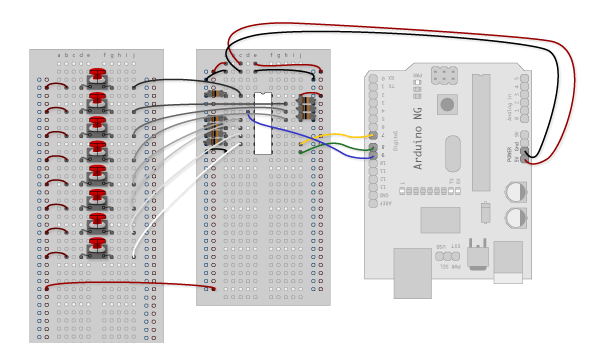 The transfer of information on the data pin is called "Synchronous Serial Output" because the shift register waits to deliver linear sequence of data to the Arduino until the Arduino asks for it. Synchronous Serial communication, either input or output, is heavily reliant on what is referred to as a clock pin. The clock pin is the metronome of the conversation between the shift register and the Arduino, it is what keeps the two systems synchronous. 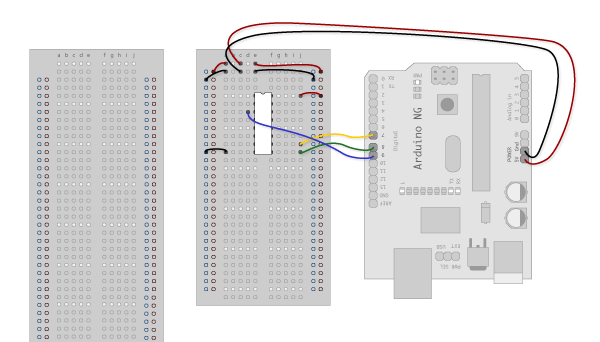 Every time the Arduino changes the clock pin from LOW to HIGH the shift register changes the state of the Serial Output pin, indicating the value of the next switch. The third pin attached to the Arduino is a "Parallel to Serial Control" pin. It is referred to as a latch pin. When the latch pin is HIGH the shift register is listening to its 8 parallel inputs. When the latch pin is LOW, it listens to the clock pin and passes information serially. That means every time the latch pin transitions from HIGH to LOW the shift register will start passing its most current switch information. This is a basic diagram. There is more information about shifting in the ShiftOut tutorial. PINS 2, 12, 3 Q6, Q7, Q8 Serial Output Pins from different steps in the sequence. Q7 is a pulse behind Q8 and Q6 is a pulse behind Q7. Q8 is the only one used in these examples. From now on those will be refered to as the dataPin, the clockPin and the latchPin respectively. Code Sample 1.2 What is Pressed? 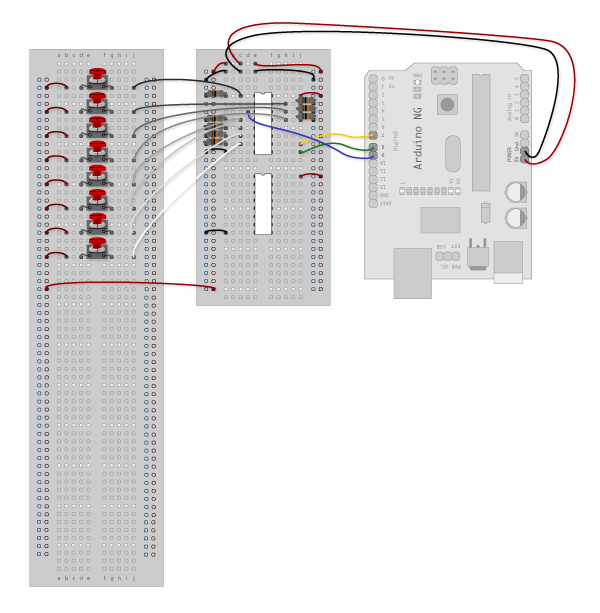 In this example you'll add a second shift register, doubling the number of input pins while still using the same number of pins on the Arduino. If supplementing your Arduino with an additional 8 digital inputs isn't going to be enough for your project, you can have a second CD4021 pass its information on to another CD4021 which will stream all 16 bits of information to the Arduino. If you know you will need to use multiple shift registers like this, check that any shift registers you buy can handle Synchronous Serial Input as well as the standard Synchronous Serial Output capability. Synchronous Serial Input is the feature that allows the first shift register to receive and transmit the serial output from a second one. The example below details how to use this system. 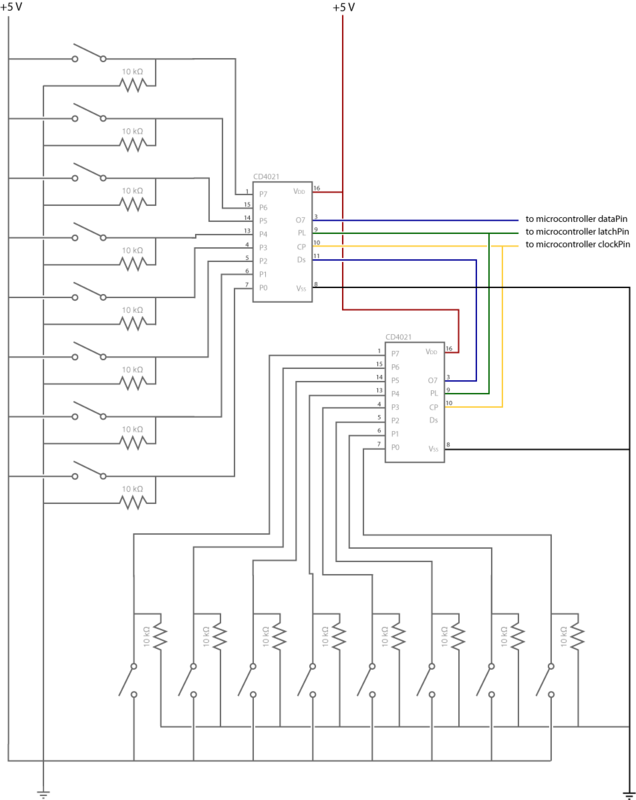 Within reason, you can keep extending this daisy-chain of shift registers until you have all the inputs you need. 3. Add a second set of Switches. Notice that there is one momentary switch and the rest are toggle switches. This is because the code examples will be using the switches attached to the second shift register as settings, like a preference file, rather than as event triggers. The one momentary switch will be telling the microcontroller that the setting switches are being changed.